I don’t claim to be an expert on China but I have survived for four months now living in Shanghai so that has to count for something, right? If I can download some useful information to visitors and expats coming here and save a life or two, I will consider this a worthy post. Now, on to life in Shanghai. This is a fascinating country in the throes of constant change. I appreciate the history, culture and people. I hope you will enjoy your trip or relocation here. If you follow my tips, your experience in China may be better and you will have wonderful memories to bring home. Pack that air mask and off you go! 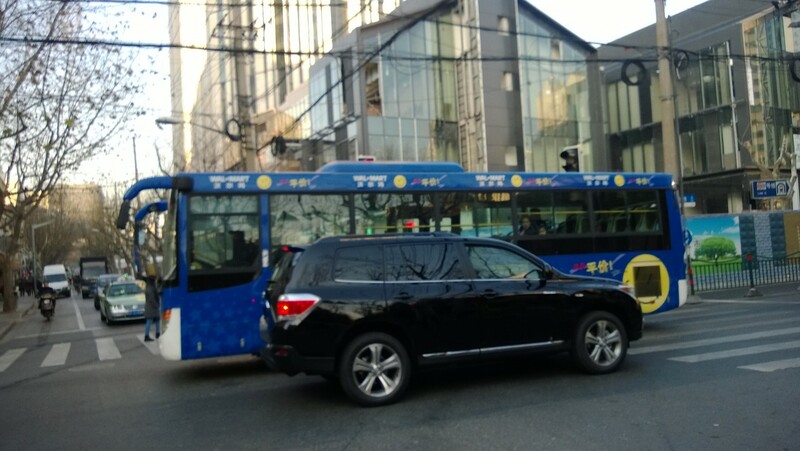 Buses own the road-they drive fast and won’t slow down for pedestrians. Stay out of their way! TRAFFIC Drawing on wisdom from Patches O’Houlihan “if you can dodge a wrench, you can dodge a ball”, my new daily motto has become: If you CAN’T dodge a bus, YOU COULD DIE, Shanghai style. Cars park on the sidewalk because they can. 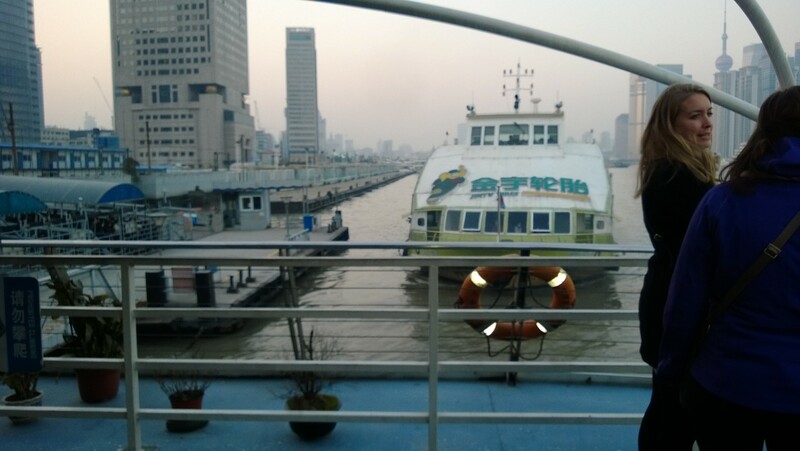 Riding the ferries takes courage but they are fast. 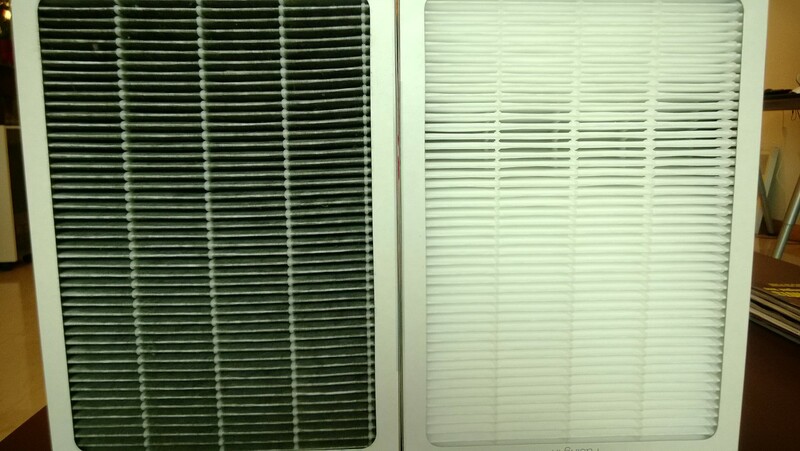 Tale of 2 air filters-white two months ago, black now with air particulate matter. Cough, cough! Roasting nuts in an open fire on the sidewalk. Cool for photos, not so cool for food safety. Never, ever drink tap water. Buy the most Western branded bottled water you can find and use it for everything including to brush your teeth or wash off fruit/vegetables. Never, ever eat street food. I walk these streets daily and I can’t even begin to tell you the horror stories of non-existent food prep standards. Every day in the paper you read stories about reusing old oil to cook, subbing out fox for donkey at Wal-Mart, etc. There are Western groceries and restaurants that we frequent where we think it is probably better—City Shop grocery, Fresh Elements, Baker & Spice, even McDonald’s has some standards and Starbucks are everywhere. My boss gave me good advice that you should only eat where it is crowded because the grill will be hot—in an empty place, the grill will be cold so your food won’t be cooked right. Makes sense! You cannot buy OTC meds here-none-so bring Tylenol, Stomach Stuff, etc. or you will be sorry. Watson’s is the Walgreen’s of China but they only carry skin whitener (big here) and lotions/potions and nothing to help stop diarrhea, which you will get. Just hope you don’t throw up in a potted plant at the airport like I did after eating something bad. A moment I will never forget! BATHROOMS Work out those thigh muscles ladies because they still have squats in some public restrooms in buildings even in big cities like Shanghai. Yes, a “squat” is a hole in the floor that you have to use. Try doing it in heels and Spanx-I did but not by choice. When you have to go, you have to go. Always bring toliet paper/tissue and hand sanitizer with you. If you have to go, try to find a high end hotel or mall. Being a foreigner, they won’t question you and their bathrooms are quite nice. The Hotel Andaz even has heated toilet seats in their lobby restroom—I love my Toto Japanese toilet!!! TAKE OFF THOSE SHOES Phlegm flies everywhere in China. I had read about this happening but living here I have experienced dodging gobs of it–you hear it coming (cough, hack, cough) and then you RUN! With all the pollution, I have to say that I understand why it’s going on all over town but perhaps a new habit of hacking into a tissue should begin. You will also see cab drivers peeing by the side of the road everywhere and toddlers being held up to pee in the trashcans. Yep. That’s one good reason why there is a tradition here to take off your shoes as you enter your home because you have other people’s DNA all over your soles from walking the streets. GENERAL SAFETY You don’t need to carry your passport on you ever unless leaving the country or travelling within the country. They will ask for it at a new hotel. I leave my passport in a safe-all the hotels have them in the rooms and I have one now in my apartment. Use the safe for anything you leave in your room like technology, etc. It probably would be fine because theft is rare but it would be a pain in a foreign country so better safe than inconvenienced. I do feel perfectly comfortable walking the streets at night alone albeit having to dodge traffic. There is little street violence or crime. Thom witnessed a pick pocket on the street but only once—just keep your handbag across your body and walk with purpose. Always carry a map with you-most people will not speak English or think to help you if you are lost. We try to always help Laowai’s who look lost but most locals will not, probably because they don’t speak English. 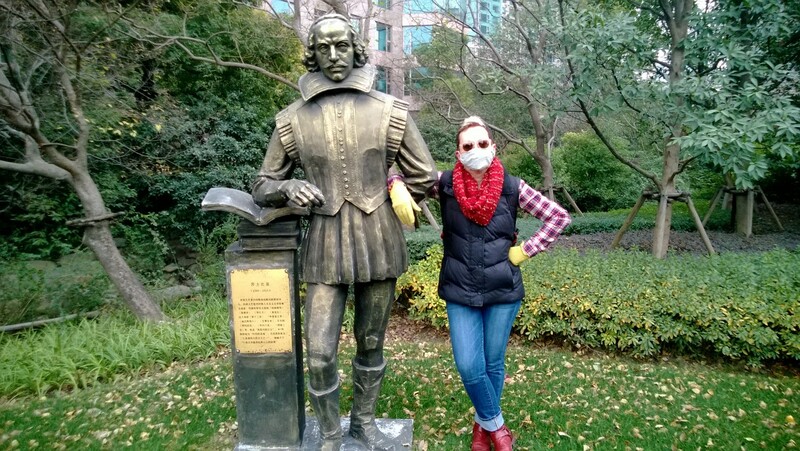 Pack your sense of humor and air mask and join me in China! Some people might be scared off by all these warnings but it would be a shame not to travel to this wonderfully complex evolving country that is so rich with traditions, (and also superstitions), history, beautiful sights and interesting people. Be forewarned, plan carefully and pack wisely. Yes, you could die but are you really safe anywhere? Life is short! 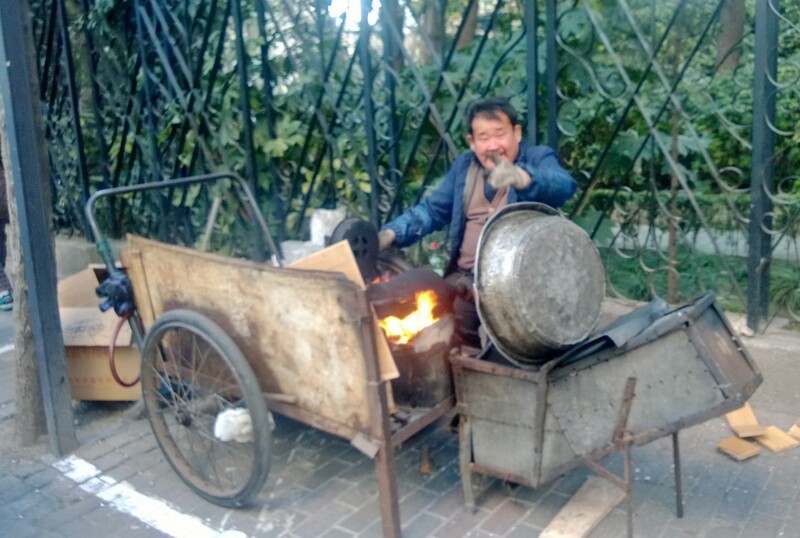 Keep your sense of humor and marvel at all the crazy things you will see if you get out and walk the streets of Shanghai. I look forward to each and every day of my wonderful adventure here. Join me in China! Hey, I grew up there (maybe not the pollution). We love it here but hopefully with this post, I can assist others to be stay safe while they are here. I was so scared walking the streets at first but now love it, though I am always cautious. Keep up the great blog!! I hope to visit soon! :) can’t believe your car accident comments-sounds really life or death. Please visit! Bring a friend–we have lots of room and would love to see you. We will make sure you are safe when you are here and enjoy all the wonders of China. good list! I think you covered lots of good points! Thanks! I’ve been accumulating these thoughts for awhile as I walk around. I’ve learned a lot and just wanted to share so others can not be frightened when they get here but be able to enjoy this amazing place. An entertaining list of the things to warn people about before they get to China! 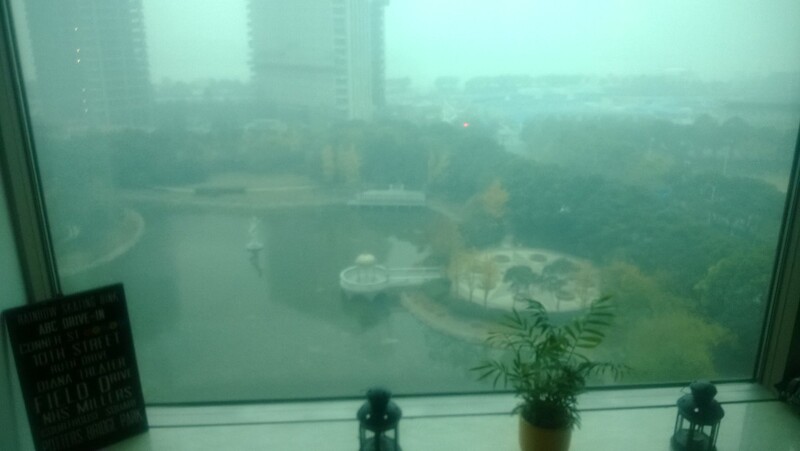 I have found though, that after a few months, this all becomes par for the course, and it is actually quite manageable and FUN to walk around and live in Shanghai. 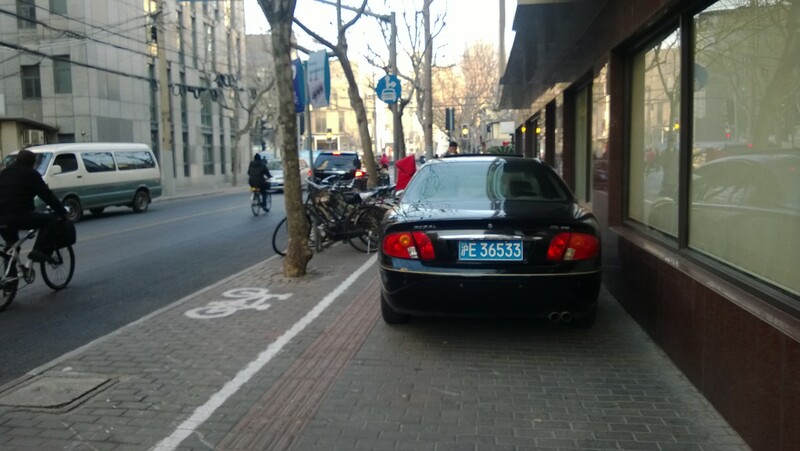 In fact, I have adopted some of the walking/driving/biking techniques of the Shanghainese without even realizing. Might share this post with my parents though before they come for a visit in April so that they are ready for all that is China! I agree that you do get accustomed to the techniques to get around after awhile and I am not as scared as before, though I am always aware of my surroundings and cautious in order to stay safe. I wrote this piece to help others so they might be forewarned and prepare so they can enjoy China more. No surprises! I hope your parents enjoy their visit. Perfect. I totally agree that this allows people to really enjoy the country more. Thanks and keep the posts coming!